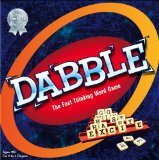 For dads and kids who like words, Dabble is a fun, and speedy alternative to Scrabble. You can play in just five minutes, which is perfect for time-frazzled dads and attention-challenged kids and teens. We like games like this that are simple and direct. No directions here with tons of exceptions and twists and turns. The rules of the road are simple. You get 20 Scrabble-like tiles and the objective is to make five words out of them: one with 2 letters, one with 3 letters, one with 4, one with 5 and one with 6 letters. It’s both not as hard and harder than you would imagine. My kids right away figured out that the best strategy is to do the long words first and work your way down. Inevitably, you run out of vowels or consonants though as you get closer to the end. If after three minutes, there is no winner, as in Scrabble, you throw back letters you think have been challenging and hope for better substitutes. But do you throw back just one or ten? The second round obviously moves a lot faster since most players are only looking to finish one or two words. If the game gets too simple, you can dial it up a notch for all or some of the players by limiting the categories from which players can draw words. Maybe mom and dad can only use verbs, or household items while Junior can use the whole dictionary, foreign words and proper nouns to even the playing field. The game is for players 10 or older. My 7 year old had more patience with the game than my 11 year old, who got very frustrated when dad won two games in quick succession. My 7 year old made a lot of words, but most of them were misspelled (“phork?”). And you know what else I like? Dabble comes in a simple rectangular box with a cover that goes on snugly and keeps everything inside. There is one wasted piece of cardboard, but they didn’t throw in a lot of paper to make it a bigger package. The instructions could have been printed on the inside of the box, like the old MB games, but you can’t have everything. Then again, as I said, the instructions here aren’t the complicated. I’m holding onto Dabble for when my daughter is a few years older. She’s good with words and spelling and I’m sure she’ll be able to beat me in no time.